Best. Barcode. Reader. Ever! Scan UPC / EAN codes and hear the names of over 37 million products! Make your own QR code labels on the Digit-Eyes website and print them on inexpensive address labels. 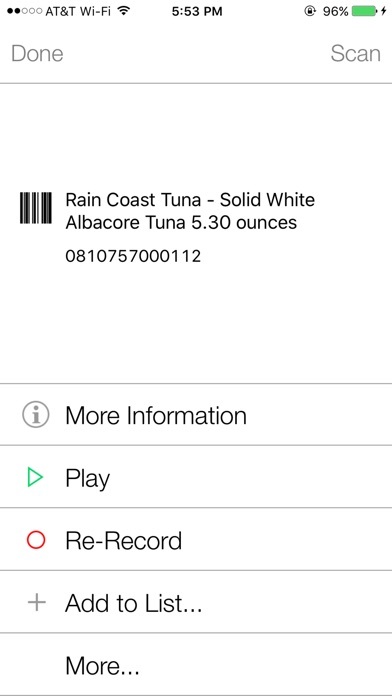 These barcoded labels may contain text that VoiceOver reads aloud or they can be used to record audio on your iPhone or iPad that is played back whenever the bar code is scanned. Blind? Dyslexic? Having problems reading? Digit-Eyes is for you! With Digit-Eyes, you can - Record your own labels. Visit the Digit-Eyes web site to print specially coded quick-response (QR) digital code labels, apply one to your calendar or a box of leftovers, scan, and record a message. To listen to the recording, just rescan the label. This is how Nancy keeps track of her appointments; how Jeanette labels her canning and how Randy keeps the fridge clean. - Make text-based labels. Visit the Digit-Eyes web site to type up to 250 characters per label, print the specially coded quick-response (QR) barcodes on address labels on your local printer and apply them to your file folders or CDs. 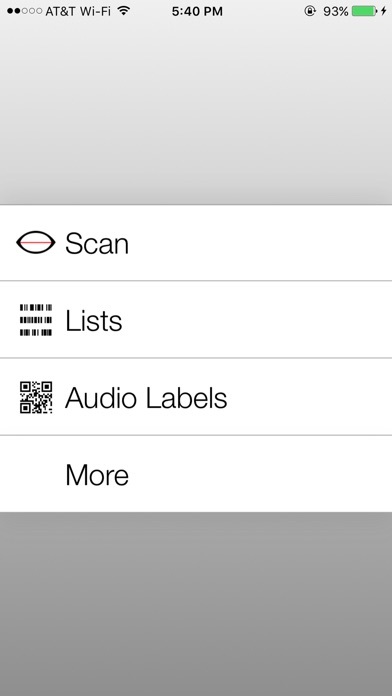 To listen to the text, scan it with the Digit-Eyes application on any iPhone or iPad. This is how Will’s secretary labels his folders and how Ana snoops through her friends’ CD collection. - Buy pre-printed washable labels. Sew them into your clothing and record whatever you want to about the garment: color, fabric care or what it should be worn with. Even when the labels have been washed, bleached, sent through the dryer or dry-cleaned, you’ll still be able to scan them with the Digit-Eyes app on your iPhone or iPad and hear what you recorded about the garment. This is how Davey makes sure he is wearing matching clothing and how Elizabeth can easily sort the laundry. - Use the manufacturer's product code to find out what the item is. Digit-Eyes includes a feature that enables you to identify many groceries, CDs, and other consumer goods by scanning the UPC and EAN codes on the products. 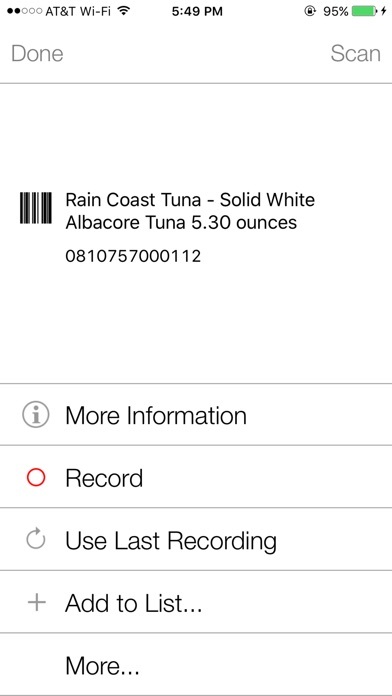 Just point the camera of your iPhone, Pad or iPod Touch 5g at a package label, scan the code, and wait for Digit-Eyes to call our database and tell you what the item is. This is how Deborah picks out her yarn, how Kevin finds the beef stew, and how both get ready to record their audio labels. - Read standard inventory tags in code 39 or code 128 format. This is how Michael knows which printer is which at work and how Ben does the shelf stocking in his store. - Print labels directly from your iPhone on your Bluetooth-connected printer; - Create and read QR vCard format business card information and add the content to your contacts. This is how Digital Miracles gets information from customers at conferences and how we share our own contact information; - Create lists of code that you've scanned; edit them, type additional information and share them with others. This is how Robbie notes what items are getting used up and tells Gary what to buy at the store; - Use Digit-Eyes with any blue-tooth connected laser scanner, integrated as a single unit. This is how John is able to work at a grocery store reading the shelf tags to find where to stock the product. Use of the free Digit-Eyes website comes with the product. The website contains extensive tutorial material designed for users of the iPhone and iPad who are not sighted. The product purchase also includes free online support and tutoring. Digit-Eyes is available in English, Danish, French, German, Italian, Polish, Portuguese, Norwegian, Spanish and Swedish. Digit-Eyes www.Digit-Eyes.com The solution is in your hands. Customer some more support is terrible! Been trying a month to get technical support to help with the printer time out problem. Both phone call attempts and email attempts failed to get a response. Do not recommend relying on this apps technical support for any assistance. Less than one star. I like this app, but except for one thing. I would also like to have the prices read along with the item. How are you suppose to know what the price if you're blind/visually impaired? Doing a web search will take to much time, and you won't be able to find someone all the time in the store. What do you do then???! This app if you know and have patients how to learn how to focus your camera and look for the barcode is very good. 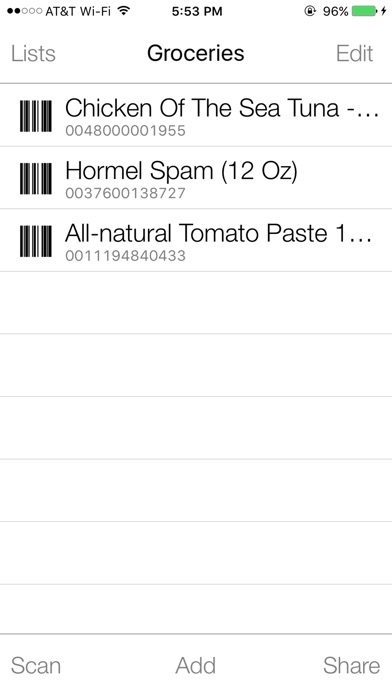 It can be difficult to use but not because of the app, more because of my not knowing where the barcode is. I appreciate the beeping to let me know that I am close to the barcode. Once the barcode is found, the app will give you the name of the item. It does not search any product databases to give detailed information. I am not sure why it claims to be the best. 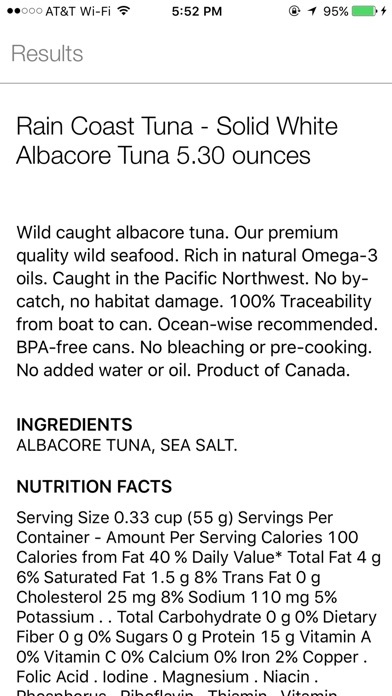 I have already found three average products it does not recognize. Also, if you are looking for cooking instructions this app will not suffice. While their are several barcode scanners available, this one is the simplest to use without sighted assistence. Right away it recognizes a lot of the things in the average kitchen. Figuring out where exactly the barcode is on items to scan them in the first place is the hardest part but does get easier with practice/experience. The more advanced functions of the app are optional, but it only gets more and more useful the more you dive in. Definetly read the website's tips to get all the use out of it. It helps to turn objects on their side, and scanned from above. It still takes some time for some objects that are larger, but it does work. Certain things are found relatively easily, and it Recognized most of the things that I threw at it. Somethings have directions for use, other things do not. I would say that overall then, this is a quick, or relatively so, way to at least figure out what you're holding. I've had this app for about 2years now, and it's still useful. Hands down this app has helped me so much and is a great tool for finding products in my kitchen. Bought this app for my visually impaired mom. When it works, it works great. But most of the time even with a perfect image of bar code, the app can't see it. Seems to like boxes better than cans. Only worked about 10% of the time. Please note I am not complaining about local brand bar codes needing to be added. If that is all it was this would be a great app. But it just doesn't "see" the barcode to begin with. App should been free or at least no more than $3. This app works with the built-in device voice over. There are many free QR code scanners and creators that will do the same thing. Very disappointing I paid for this. I thought it had something more for the price. Run - don't walk - from this app. More by Digital Miracles, L.L.C.